Bus from Seremban to Jitra is the smoothest and convenient way to travel from Seremban to Jitra. Many locals rely on this bus service to travel back and forth between Jitra and Seremban. This direct bus service can save passenger's time and money from getting to Kuala Lumpur Terminal Bus Bersepadu to transfer bus to Jitra. 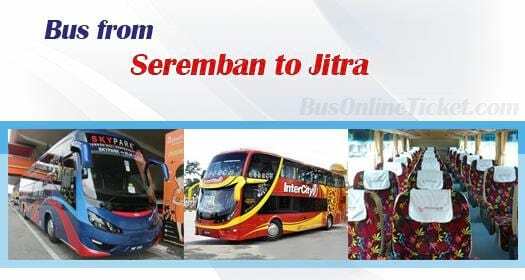 Why Taking Bus from Seremban to Jitra? First, there is no train service available for this route. Second, there is no direct flight service from Seremban to Jitra. Passengers are required to get to KLIA or KLIA2 to take flight from Kuala Lumpur to Alor Setar. After that, you need to transfer bus from Alor Setar to Jitra. Thus, direct bus service is the most preferred choice among travellers to travel from Seremban to Jitra. Trans MVS Express and Intercity Coach are the two famous bus operators offer bus from Seremban to Jitra. Their combined trips have total up to 4 daily departures with 2 departures in the morning and 2 departures in the evening around 10:00pm. Bus from Seremban to Jitra takes on average 8 hours. The travel time is depending on the road traffic on departure day. Washroom break will be given during the journey. Passengers can request for additional break from the driver during the journey. The bus fare from Seremban to costs in a range of RM 55.00 to RM 65.00, depending on your selection of bus operator. The boarding point in Seremban is located conveniently at Seremban Bus Terminal One. The bus from Seremban to Jitra will drop off passengers at Jitra Bus Terminal. BusOnlineTicket.com is the most user-friendly and secure online ticketing portal in Malaysia and Singapore. We advised you to book your bus ticket from Seremban to Jitra in advance with BusOnlineTicket.com to avoid disappointment especially during peak season and weekend. We accept various payment method such as Visa, Mastercard, eNets, Paypal, Alipay and many more payment methods to bring you great convenience.